A vibrant show of color washes over the Mondavi Center's south wall in a show of support for the LGBTQIA community everywhere in the wake of the tragedy in Orlando. A member of the campus community suggested the rainbow-light display, and the Mondavi Center's technical crew made it happen. What was originally planned as a one-week display will now run until July 12, the one-month anniversary of the shootings at the Pulse nightclub. Campus units also are hosting a series of Community Healing Spaces; the next one is Tuesday, July 5. Clockwise from top left: Cindy Rubio Gonzalez, Katherine Whittaker Ferrara, Jennifer Sinclair Curtis and Chen-Nee Chuah. The number of female engineering students is small but growing, and they have no shortage of role models at UC Davis. 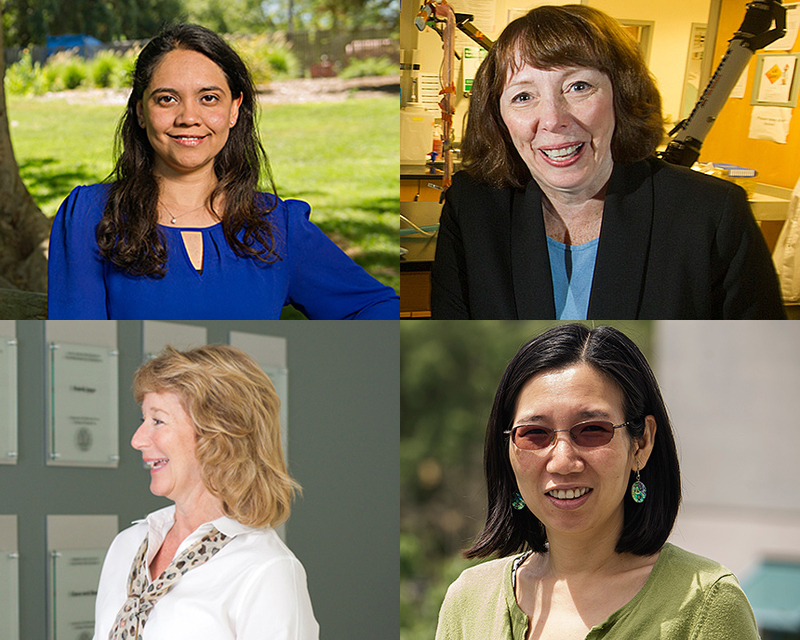 Get to know four of them, including the College of Engineering's first female dean, in this Q&A. Want to grow something on campus? Britta Hansen and Elise Brockett plant okra and other vegetables at the Horticulture Innovation Lab Demonstration Center in September 2015. It'll likely be a little warmer when the winners of the "Pitch-and-Plant" do their work! The Horticulture Innovation Lab is looking for a few green thumbs to grow summer crops in four raised planter beds at its demonstration center during the summer months. If you have a good idea and a few hours a week to care for the crops, you can submit an idea to the lab's Pitch-and-Plant Gardening Contest. The deadline is Friday (July 1), and entrants must submit their ideas through a three-slide PowerPoint presentation. The finalists will pitch their ideas in person, and the winners will be growing from July 18 until October. Contest details are available on the Horticulture Innovation Lab's blog. Facebook: The members of the UC Davis Cal Aggie Marching Band-uh! performed at the nation's largest event celebrating the LGBTQIA community, the San Francisco Pride Parade. Instagram: A dance party breaks out during the opening ceremonies of the Special Olympics Northern California Summer Games, held on campus over the weekend.